I have taken this out of context and I know that it wasn’t that simple a distinction being made, but the phrase stuck with me a little, as did the idea that somehow being a teacher is inferior to being a manager of teachers. 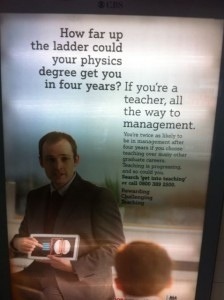 So it was with no little sense of irony then that I saw (or rather saw again) a poster in the train station saying, effectively, that in four years a new teacher could become a manager. Not that there’s anything wrong with being a manager, of course. Not at all. But there’s equally nothing wrong with being “just a teacher”. After all, that’s the main job in education, isn’t it: surely you don’t go into education with the express aim of achieving manager status, do you? Or is that just me? Just a thought, really, just a thought. I’m glad you pointed that out. It’s such a maddening phrase and so reflective of the status given to some roles over others – completely unnecessarily. I find it really frustrating that the only career progression for a lot of teachers (and many other professionals) is management which actually takes a load of different skills to teaching. I wish it was more socially acceptable (and rewarding) to stay ‘just a teacher’ and become an expert in your field. I also completely agree, I’ve thought this a lot before, and have caught myself saying it, even recently. I guess by “progressing up the career ladder” as it were, it could show that you have additional skills, like managerial AND teacher skills. But as Esther says, the whole career ladder thing is questionable in itself, lots of people don’t necessarily want to be a manager, and also I don’t think there’s an inherent link between being a good teacher and being a good manager. I am a manager…just a manager…I just about manage. I do a little teaching. I just stopped by to make the point that teachers are actually managers/ charged with managing the learning process and responsible for the progress of their students. But the “managing learning” skills of the teacher are different to the “managing people as employees” skills. They have different concerns and priorities. But this wasn’t meant as dig at managers, more that actually there’s nothing bad about being a teacher!